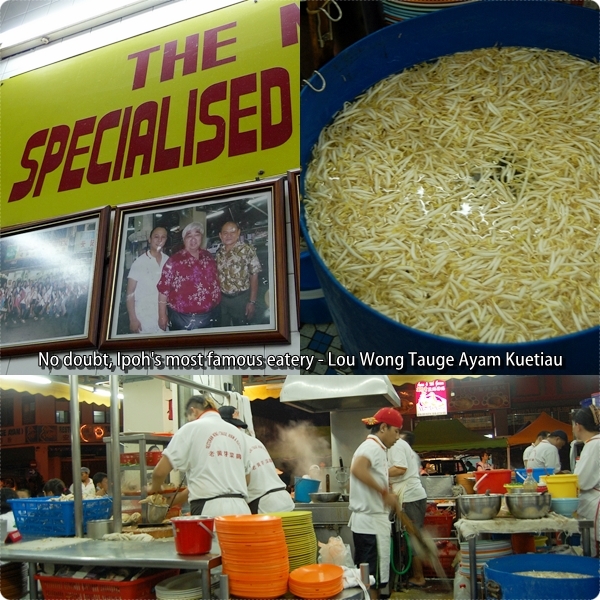 Restoran Lou Wong Tauge Ayam Kuetiau has to be the MOST famous of all Ipoh’s restaurants, bar none. Ask any outsiders, foreigners, or even the locals themselves on where to have dinner (or supper, commonly) if you’re down in Ipoh for one night only, the chances are most would mutter the name; Lou Wong Nga Choy Kai (“Nga Choy Kai” means Tauge Ayam, or Bean Sprouts Chicken). Even when most locals do not frequent the highly-sought after, yet slightly over-rated premise any longer. 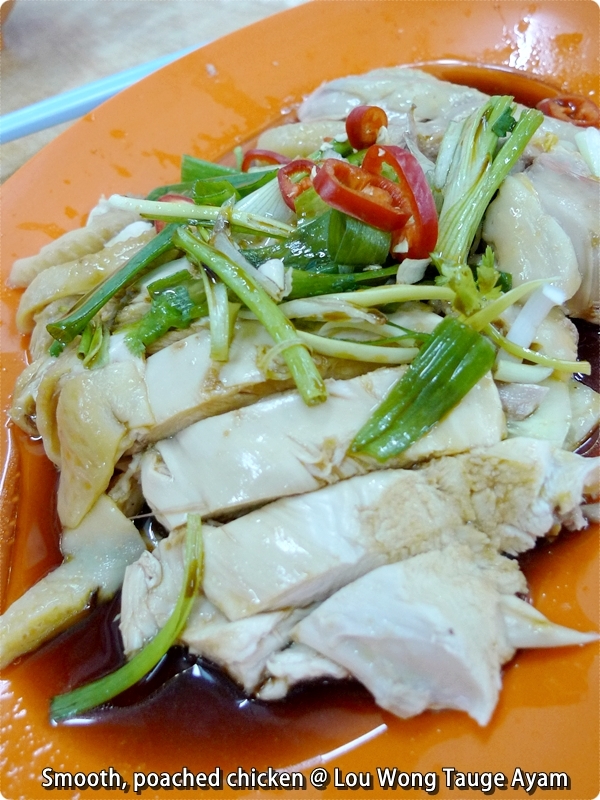 You can find out more about other Nga Choy Kai outlets in Ipoh by clicking the following link : Tauge Ayam in Ipoh. 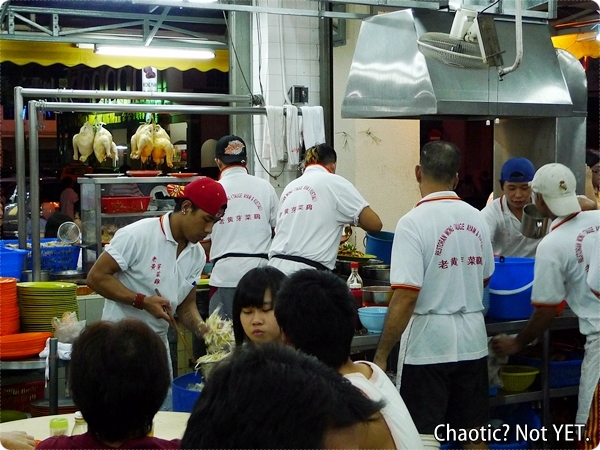 Come early or come late, and you’re bound to get yourself worked up, frustrated, or even astonished at the sheer amount of human traffic going for their Ipoh famous bean sprouts chicken fix. Come rain or shine, night or day. For your information, Lou Wong opens for lunch and dinner now, until the late hours of the night (or should I say wee hours of the morning?). If you’re there on a weekend, or public holidays, be prepared to stand around (much like Foh San, but only not as sightly, for you’re practically forced to stand by the roadside for this one). You see, I never hide the fact that I’m not a fan of Lou Wong, or even Onn Kee’s brand of Ipoh Tauge Ayam. For the uninitiated ones, Onn Kee is Lou Wong’s utmost rival, situated right across the street. That probably explains why I never wrote about these two mega-establishments although I’ve been blogging for nearly two years now. And of course, second closest excuse would be sheer laziness, for I’d rather opt out than jostling with the crowd for chickens and bean sprouts. Ahem, how ‘UN-Ipohan’ can I get?! But still, when out-of-towners came down for a visit, or foreign relatives lamented that there are NOTHING to do in quaintly serene Ipoh, I had to draw the ace card, and brought them over to these same old brands of trusted eateries (as tourist-y as they might be). At the very least, the throngs of people alone would be sufficient to instill a sense of awe in them. Except of course, those with jaded palates, and pampered with delicious food all year round. Then Lou Wong and Onn Kee are straight NO-NO’s. Don’t believe me? Go ask the locals residing in Ipoh. Any foodie worth his salt will tell you that Lou Wong serves mediocre chickens nowadays, and some proclaim Onn Kee to be the superior choice. On to the food now, before my ramblings start to take a life on its own. The bean sprouts at Lou Wong, or Onn Kee to some extent is REALLY great stuff. Crunchy, juicy and fat, the tauge (in Malay) is lightly blanched, then tossed lightly with a dash of soy sauce, and some sesame oil for that extra, inviting aroma. The garnishing of chopped scallions and red chillies lend some colours to the pale-as-snow plateful of fibres, guaranteed to have you craving for more. Unless, of course, you’re one of the very few who DO NOT like your vegetables cooked lightly. For I have a few peers who hate the raw, ‘greenish’ taste of the bean sprouts. Unless they’re stir-fried with salted fish, or blanched until soggy/soft. Yucks? There was once when my experience at Lou Wong was marred by bloody chickens. Yes, RAW and GLISTENING flesh, almost translucent. Poke into the tender flesh and blood oozes out, really. Definitely not for the squeamish at heart, for chicken sashimi is NOT your everyday dish, that’s for sure. But thankfully this time around, Lou Wong managed to get things right. But definitely not on a stellar level. At the rate they’re cooking the chickens, chopping them up with gusto and dishing them out on those familiar oblong, melamine plates – QC was almost too hard to assure. Our half a chicken was poached well, but the chicken was far from tender and smooth, bordering on tough and chewy, especially the fleshy parts (breast meat and upper thighs). Of course, I’d still take this variety compared to the uncooked version of the same chicken. 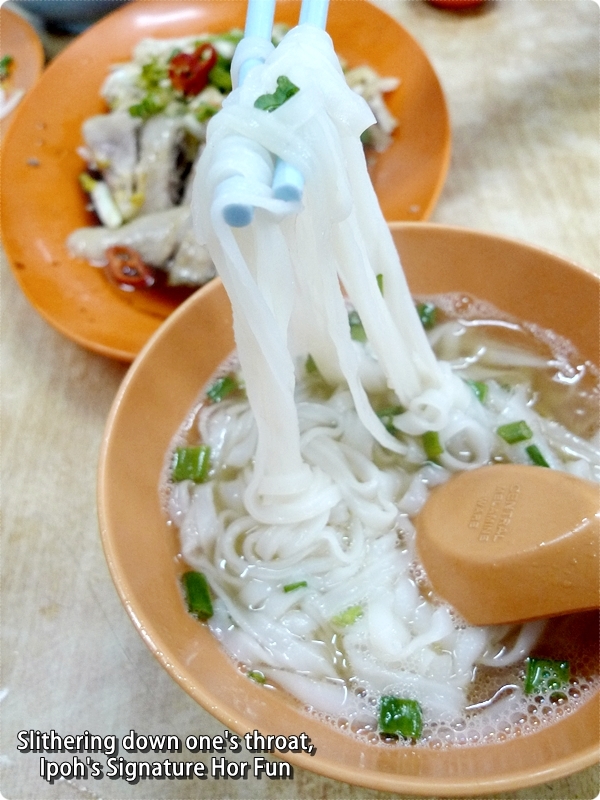 The Ipoh’s classic ‘Sar Hor Fun’ (flat rice noodles) can be served dry (tossed with soy sauce and dark soy sauce) or in soup (the more popular version, in a sweet-tasting broth flavoured with chicken bones, parts, and a dash of pepper). The noodles at Lou Wong deserves a commendable mention, even when compared to the other challengers, ie Buntong Ayam Tauke, Fifteen Tower Tauge Ayam and Kam Hor in Ipoh Garden. Silky smooth, rendering chewing almost irrelevant, the noodles slither down one’s throat with ease, and for some extra oomph, some even pour a whole saucer plate of soy sauce with chopped ‘cili padi’ (those FIERY bird eye chillies) into their bowl of broth. The meal for three came to about RM22 / USD6.30. Ordering of food and drinks is never a hassle, as everyone orders the same dishes, more or less. You can ask for the ‘spare parts’ (chicken offals lightly boiled then served with soy sauce), or even braised chicken feet, aside from the perennial favourite of pork meatballs. Just don’t ask for a menu, or extraordinary requests, for you’re bound to get chided. Sarcastically. I overheard the next table’s patron asking for a warm drink, and got scolded! As they serve the same generic beverages (barley, herbal tea etc with ice cubes) to your table, so you can just pick your preference from the metal trays. WikiStreetFood,Vkeong, Feedmelah, Bangsar Babe, Ipoh Chai, Places and Foods, Gourmetsharing, Life Thru The Lens, Malaysiabest, Travelerfolio, and Niki Cheong. I really hate the raw taste of the bean sprouts, something like ‘milky’ taste, very geli, but I seldom go to Lou Wong nowadays..nothing special lo. True lah, I also go only when there are tourists coming over. OMG I totally understand what you mean about bloody chicken… Eeww…. .-= iamthewitch´s last blog ..Bangkok Wasabe and Christmas at e@Curve =-. Get scolded? Does this happen before they become famous? Erm, it’s normal don’t you think so? When the turnover’s great, and they’re famous, most eateries also will become a bit arrogant, and not too accommodating to your needs. 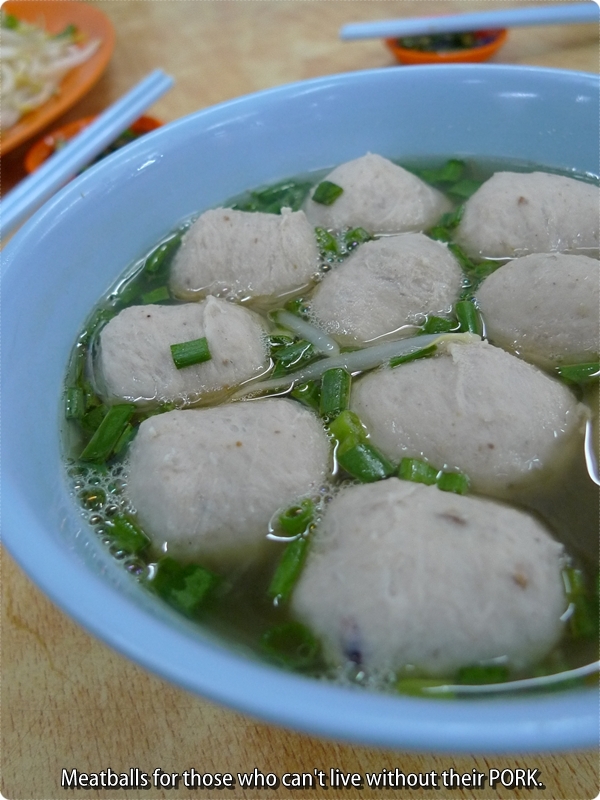 I love ipoh ngah choy kai..
the ipoh kuetiew cannot be tasted anywhere other than ipoh..
Really? I have never tried to tapau from Lou Wong, nor Onn Kee. Cz it’s rather hard, to be packing away the noodles, the chicken and the tauge separately. LOL. You think they care?! I was told by a fellow Ipohan businessman that there was a change of ownership. Lou Wong decided to cash out. Anyhow, I prefer the competitor. Usually the chicken will be bathed with hot broth to heat it up and get the blood off the exposed bones. Really? Never knew about this story. Cash out?!!! OMG. 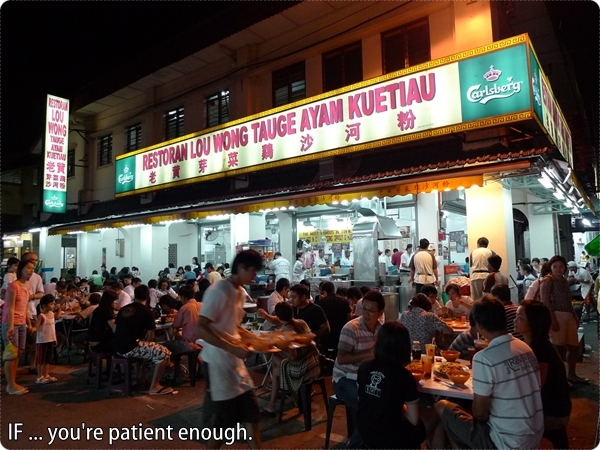 Lou Wong is possibly the MOST recognized brand in Ipoh, aside from Old Town, and Yee Hup. James, did you notice that they poached the chicken together with the plastic raffia???!!! Nope, I did not see that. Let’s hope the strings did not melt into the broth! i am here to talk about this bean sprout. and for your information..it is cooked..not raw and half cooked. In lou wong, they also sell the chicken feet.Quite nice. I will never failed to taste it every sem break. Bout the noodle..the hor fun.Very soft and chopstick slip. never failed to eat another bowl. Hi Nic. Thanks for that clarification. Yes, the bean sprouts are lightly cooked, to retain that crunch and freshness, and not stir-fried else they’ll become soggy. 1 minute’s walk!?!! You stay in town area then? Honestly, THERE are a thousand more better places to eat other than Lou Wong and what’s his face across the street. I’ve been avoiding it like a plague since I was in primary school. Think KL got better chicken. But Ipoh still got better taugeh! Sadly, Monkey, I do agree with that. The chickens are getting from bad to worse, sometimes raw, sometimes overcooked, and definitely too greasy to my liking. But still, the TAUGE rocks. Big time. 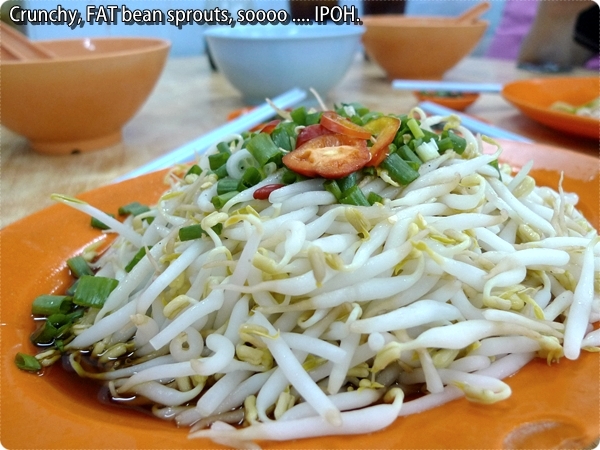 Guess the chicken is about the same anywhere, but I must say the bean sprout in Ipoh is extraordinary. I like it very much. Only the taugeh is nice …. the rest …. hmmmm …… I found better chicken in KL too …. J2KFM, A Merry Christmas, a belated wish to you and hope you have a jolly makan2 this New Year! ho ho ho! bloody chicken definitely a “No” for me too, but some ppl like it ~~ yucks!! Tapau! Tapau! Raw beansprouts from the market! I love this dish but only the chicken… I don’t really eat taugeh 😛 normally my wife sapu all the plump and juicy stuff!!! this shop is just so famous. But we tried Onn Kee instead of this during our last visit. I miss Ipoh’s Chicken! couldn’t find this in KL. Smooth and the skin is just so…. ‘chewy’. haha. Lou Wong and Onn Kee are like yo-yo’s to me. Sometimes Lou Wong’s better, and at other times not. The Hor Fun is definitely better at Lou Wong’s, while Onn Kee’s chickens are slightly better. That makes me a die hard fan of Lou Wong??? The waiting time at Buntong’s ayam taugeh was too long,and that was a big turn off. At Lou Wong, the serving time is pretty fast. Some relatives from KL insists on Lou Wong whenever they come for a visit. Once, Lou Wong was closed for business and the only option available was nearby Onn Kei. They preferred to dine elsewhere. No Lou Wong, no chicken beansprout ! And well, they are my relatives and it could be in the genes. Lou Wong for me, but not the crowd. Therefore, if I go, it would be lunch time when the crowd are manageable. Buntong’s version was nothing special, and even oilier than Lou Wong’s! And that says a lot. Onn Kee also okay lah, comparatively. Or you can try Cowan Street mah, but given the rather erratic business hours of Cowan Street, I’d suggest to confirm first. This is like another must stop place when in Ipoh. Love the beansprouts. Heavenly crunchy! Nvr been here heheh..and looks like I’ll NEVER step in. For one I hate bad arrogant service. 2, I absolutely abhor badly prep food. So if ya comin KL, lets try Sek Yuen.. I knw u been sayin tht u cant get enough ppl tp go w u right? I went once, didnt thrill me the slightest bit but I think there are more on their menu to staple. what’s up with anti-taugeh people?! I have KLites up in arms, waving taugeh’s away when having Nga Choi Kai. Sigh hard to change the Ipohan in me. Lou Wong’s and Onn Kee’s are both uncomparable, brand wise. But quality wise, Cowan Street is still better, even Kam Hor’s is good. Nevertheless, the hor fun and taugeh are still Ipoh’s! should we trademark em? This one dafinately value for money cheap and good.